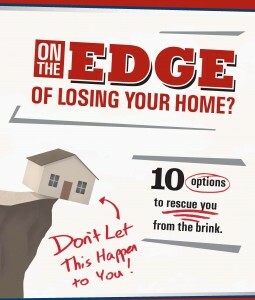 You are here: Home » My Blog » On The Edge of Losing Your Home? At Windows Over Washington Realty Group we often get questions from our clients asking the difference between a foreclosure and a short sale. The graph below highlights some of the major differences. Sellers can see why it is a lot more advantageous to try to sell their home- even as a short sale than to walk away and let their home foreclose. If you or someone you know has any questions about selling their home, have them give us a call at 202.642.6342. A homeowner who loses a home to Foreclosure is ineligible for a Fannie Mae backed mortgage for a period up to 7 years with some exceptions based on extenuating circumstances. See: efanniemae.com A homeowner who successfully negotiates and closes a short sale will be eligible for a Fannie Mae-backed mortgage after 2 years with a 80% maximum LTV ratio. Score may be lowered anywhere from 250 to over 300 points. Typically will affect score for over 3 years. Only late payments on mortgage will show, This can lower the score as little as 50 points if all other payments are being made.A short sale’s effect can be as brief as 12 to 18 months. A challenging issue If a client has a foreclosure and is a police officer, in the military, in the CIA, Security, or any other position that requires a security clearance. In most cases clearance will be revoked and position will be terminated. On its own, a short sale may not challenge most security clearances. In deficiency states the bank has the right to pursue a deficiency amount of the loan. This amount is often more in a foreclosure. In some successful short sales it is possible to convince the lender to give up the right to pursuit a deficiency judgment against the homeowner.